Melamine Wood Glue, White, 1 gal. 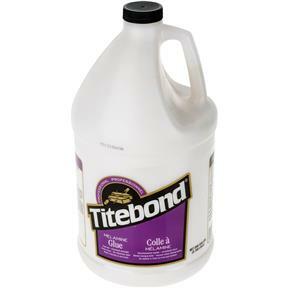 Titebond 4016 - Melamine Wood Glue, White, 1 gal. Titebond Melamine Glue is designed for bonding wood, particleboard, MDF, and other porous substrates to synthetic materials such as melamine, vinyl, and HPL as well as metals. It offers a fast initial tack, yet has a longer open time that allows for the accurate alignment of working materials. Titebond Melamine Glue is a water-based adhesive that is non-flammable, has low odor, dries clear, and cleans up with water. Its thicker formulation offers fewer runs and drips, making it easier to use and more effective for precise assemblies. 1 gallon jug.